There are very few places in Southern California as good as Mount Pinos for back country skiing, snowshoeing and snow play. 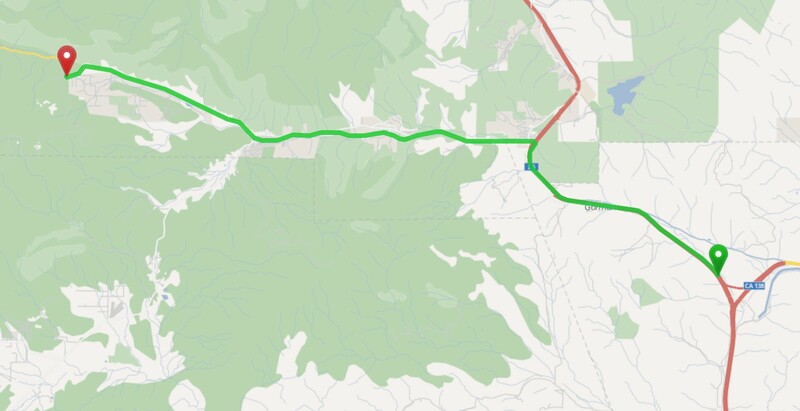 But there are also very few places between I-5 and the intersection of Mil Potero Road and Cuddy Valley Road (locally called “the Y”) that one can play in the snow: Nearly all the land is private, the road is on the sunny side of the valley and everything on and near it melts rapidly. Once past the “Y”, the road is steeper, has many sharp curves and holds snow and ice. So snow chains are often required. When there has been a good winter storm, as indicated by reports of snow on I-5 or even the closure of I-5 due to snow, people think about coming up to Mount Pinos. If that occurs late in the week and the weekend is a holiday, the number of people wanting to come up and visit the snow can be astronomical. If you were among the thousands, possibly tens of thousands, that attempted to come up on the recent Christmas or New Year’s weekend, you probably did not make it. To avoid disaster on the icy Mount Pinos road, chain control was being enforced at the “Y”. We had reports of the slow down and back up extending the 12 miles from the “Y” to the freeway and even miles back down I-5 toward Los Angeles starting near highway 138. It took people many hours to get to the “Y” only to be turned around because they did not have tire chains. Many of those who were turned back attempted to find snow play opportunities between the “Y” and the freeway. But that is mostly private land and the locals were not pleased with the trespassers and the damage done to their property. We don’t have any inside information, but we read the local newspaper for the area and look for agency press releases. From that we believe that the next time the conditions are ripe for this type of situation, it will be handled differently. First, as we understand it, there will be a road block at the intersection of Lockwood Valley Road and Cuddy Valley/Frazier Mountain Park Road in Lake of the Woods. This is about 7 miles from the freeway. You will only be allowed past if you are a local or if you can show you have tire chains. Second, tire chains will be enforced at the “Y” (Same as before). This should help with a lot of the local concerns about people trespassing, but won’t help you get to the snow unless have tire chains.